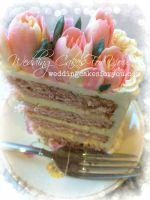 "...and I want it covered in real 24ct Gold"
I made my own wedding cake mainly as I couldn't find a decorator able to make the cake for me, for less than a thousand pounds (roughly 1,500 USD) and I *really* didn't want to spend that much! The ideas I had for my cake were pretty extreme too as I wanted my wedding cake to match my dress. Now that may not sounds extreme, but my wedding dress was a traditional Indian Lengha -Choli (skirt and blouse), bright ruby red with thousands of tiny gold jewels and beads hand sewn onto it. In Indian weddings the most auspicious colors are red and gold and the bride wears as much solid gold jewelery as possible, mostly given to her by her in-laws and parents. I wanted my wedding cake to be large-at least 4 tiers (it ended up being 5), bright red with gold piping. I also wanted to incorporate 24ct gold leaf somewhere on the cake, as pure gold is edible. The first thing I did was spend a LONG time looking for inspiration online. 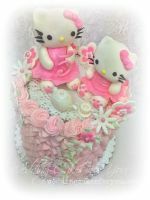 I started this when I was trying to find a cake decorator able to make my cake for me, but soon I realized there wasn't very many cakes like the one I wanted, out there! By far the BEST place to go for cake inspiration is Flickr. That site is amazing. Type in any of the key words you like and up come all these amazing pictures. My search terms were "Indian", "wedding cake" and "gold". I also searched for "Mehendi Cake" and "Henna cake" as I also wanted my gold piping to be inspired by the traditional mehendi designs, as I had worked as a mehendi artist and *love* mehendi. Armed with inspiration, I started to design the cake on paper. 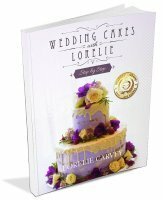 I bought books on cake decorating, including The Essential Guide to Cake Decorating by Murdoch Books, and read about how to bake cakes the right depth and height, how to cover in marzipan and how to cover the marzipan cake in sugar paste. Although none of the books I bought had anything like the design of cake I wanted, the basic steps of how to bake, cover and assemble were incredibly useful and I just amended the instructions to fit my design. Once the cake was iced and stacked, I had the biggest job – piping the design. I freehanded it all, which was difficult as although I am confident at applying mehendi (henna paste) I had never done it on a vertical surface! Certainly my experience with mehendi was valuable as it is exactly the same process – the mehendi is in a cone, which you squeeze out as you apply it, and piping with royal icing is the same. The difficulty I had was in getting the gold color that was so important to me. I tinted the royal icing with gold edible color but it just came out a pale yellow color, so after I had piped all the designs on, I had to go over them ALL again with a fine paintbrush dipped in gold powder and water. It took A LONG TIME. Once I had finished all 4 tiers, I knew I wanted to make the top tier stand out. I decided to cover it in pure gold leaf. I bought this from eBay from the only manufacturer of edible quality gold. It was expensive but not that expensive. I marzipaned the top cake like the others then brushed apricot glaze on top and pressed on the gold leaf. It was very, very fragile however and so I brought more gold leaf with me to the venue to touch up on the morning of the wedding. (I don’t advise this! If there is any way you can complete your cake before your wedding, do it! The last thing you want to be doing on the morning of your wedding is dealing with your cake!). A close up of the topper! 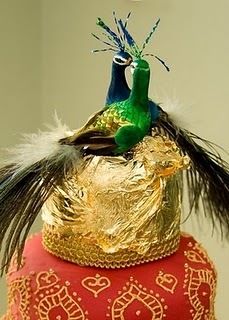 I bought some peacocks from a Christmas Decoration shop online and stuck them into the cake with the wire they were sat on. Peacocks are the national bird of India and they symbolized Ashish and I. 1)	Research! Online image searches are brilliant to give you inspiration. Nothing is impossible! 2)	Plan. A LOT. Give yourself a lot of time to make mistakes. 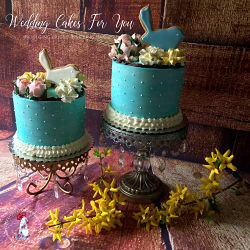 3)	Choose a cake that is going to withstand the time it takes you to decorate it and the weight of the icing and tiers. 4)	Only make your cake if you really want to – it still costs a lot to make it yourself! Comments for "...and I want it covered in real 24ct Gold"
Thank you so much for your entry! It is an inspiration to others and for all of the detail that you gave on the process from start to finish. What a wonderfully Unique wedding cake!! Not only is this cake fabulous, but so is the way you have presented it in your entry. Your creativity and drive is amazing! I feel that I have learnt a lot from you. 5 Star cake! This is very creative and makes a nice change from the traditional white wedding cake. Truely inspirational. lovin the red and gold cake it looks far more interesting than the same old usual white ones... and carrot cake too yumm my favorite! 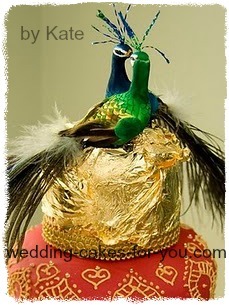 This cake is amazing and a lovely synthesis of Indian and European wedding traditions. I can't believe all the icing decorations were done freehand. A truly beautiful and inspiring creation! Wow what a stunning cake!!! I cant believe you made it it looks amazing. The detail on this is extraordinary. It'd be great to see more pics to really show that off. Really beautiful and fascinating to read the story behind it. Truly the best cake Ive seen in ages!! !well done!!! This cake looks outstanding. Well done. Love the colors and the peacocks on top! What a lovely touch! What a truly talented lady you are! This cake is stunning - your husband is very lucky to have such a creative wife. 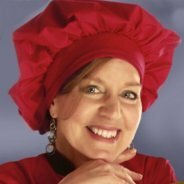 Have you ever thought of going on Masterchef?? You did an absolutely beautiful job. 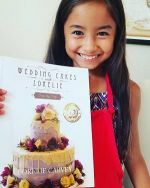 Your wedding cake creation is stunning! It should be a wonderful memory.